The GSMA Mobile World Congress 2008 is not until February 11th 2008 but mobile phone manufacturers have been handing out press releases about their new mobile phones. One of these phones is the LG-KF510. 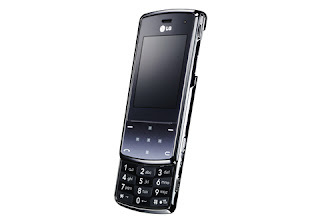 The LG-KF510 is a slider phone that sports a sleek design, almost reminiscent of Samsung's slider phones. The LG-KF510 is made from metal frame and tempered glass and is only 10.3 mm thick. The center of the LG-KF510 is a metal gradation paint scheme and consumers can choose from Stardust Dark Gray or Sunset Red. The controls on the front panel of the LG-KF510 are touch sensitive, probably like the music controls on Motorola's Razr2 phone line. It also has a 3.0 mega pixel camera and an MP3 player. That's just about all the features I can say because LG's press release didn't mention much about the features so we wouldn't know for sure if this mobile phone is as feature-packed as LG's previous releases. LG didn't mention any price for the LG-KF510, however, the company did announce that the phone will be available starting March 2008 in all major global markets.